Star Redwood Treehouse: This gorgeous treehouse is built in a cathedral of redwoods in Central California, 10 minutes from the beaches of Santa Cruz. It was constructed from one fallen redwood tree, handcrafted and milled on site with all natural pine interior and oak flooring. This is the perfect getaway for two adults. Enjoy the sights and sounds of nature while sipping your morning cup of coffee or evening glass of wine on the deck. With a comfortable new queen bed and tiled bathroom with shower, this is a great place to come home to after a day at the beach or sightseeing on the coast. 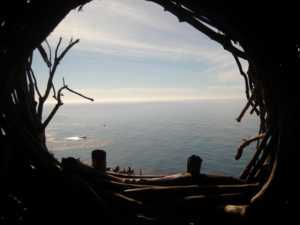 Post Ranch Inn: Nestled on the cliffs of Big Sur, the Post Ranch tree houses are single structures built on stilts nine feet off the forest floor with a stairway to each entrance. Triangular in shape, each room features a bed, window seat, desk, fireplace, and skylight to watch the stars from bed. 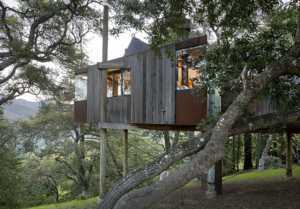 These rooms offer a luxurious opportunity for anyone who has ever dreamed of sleeping in the trees. With endless views of the Pacific Ocean in one direction and mountains in the other, the rest of the world seems blissfully far away at Post Ranch. 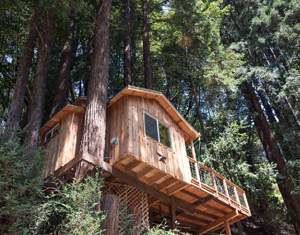 Redwood Treehouse, Healdsburg: This treehouse, located in Healdsburg, is touted to be one of the most enchanting vacation rental homes in all California Wine Country. The charming main house and romantic "La Casita" guest cottage provide a wonderful riverside vacation retreat for 2-3 couples or families. The Healdsburg area boasts a dazzling array of river activities and wine-tasting options. Rafting and canoeing are popular, and the river in front of Redwood Treehouse is clear and slow, making it ideal for swimming and floating. Idyllwild Treehouse: The perfect mountain getaway! This treehouse is perched on a majestic hillside of the San Jacinto mountains in Idyllwild, California. Relax in the peace and quiet of this cabin, featuring breathtaking views of the treetops, boulders and crestline. This quaint home is nicely secluded yet only 0.8 miles to the village of Idyllwild., just 2 hours from Los Angeles and San Diego, and 45 minutes from Palm Springs. 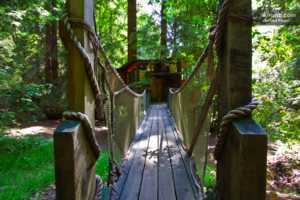 Redwood Treehouse, Corralitos: This magical redwood treehouse is located in the beautiful Santa Cruz Mountains. 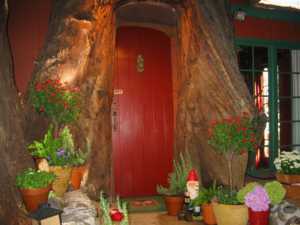 There is a live tree growing right through the main living area and another in the bathroom! This rental is a short walk through the beautiful woods from the parking area. For travelers, this is the best of both worlds - a cozy cottage nestled in the redwood forest, yet a short distance to Monterey, Carmel-by-the-Sea, Big Sur, Capitola and Santa Cruz.